Award-winning design and craftsmanship meet production efficiencies and e-glass construction. A new breed of sleek, beautiful, performance cruising catamarans is born. Drawing inspiration from the original HH Catamaran line, The Ocean Series delivers safe, blue-water capable, luxury cruising catamarans at a fraction of the cost and build time. The shared pedigree is evident: Morrelli & Melvin design and engineering, state-of-the-art boat building processes, and a careful eye for aesthetics and finish quality endure. Combining the strengths of the HH brand with new production efficiencies and lower-cost materials, the Ocean Series makes the dream of sailing the world’s oceans on a fast, beautiful cruising catamaran more attainable than ever. The Ocean Series is designed to be ocean ready, strong yet graceful, and prepared to take you to the remote corners of the globe in comfort and ease. The first of the series, the OC50, was designed with the cruising couple in mind. A safe, stable platform with easy-to-manage sail handling and straightforward systems. Don’t be fooled however, the OC50s is anything but ordinary. The Ocean Series was created to emphasize the pure joy of sailing - a yacht capable of cruising around the world in style through exceptional design, intuitive systems, envy-inducing aesthetics, spacious and comfortable living spaces, and safe, responsive sailing characteristics. WHAT SETS THE OCEAN SERIES APART? 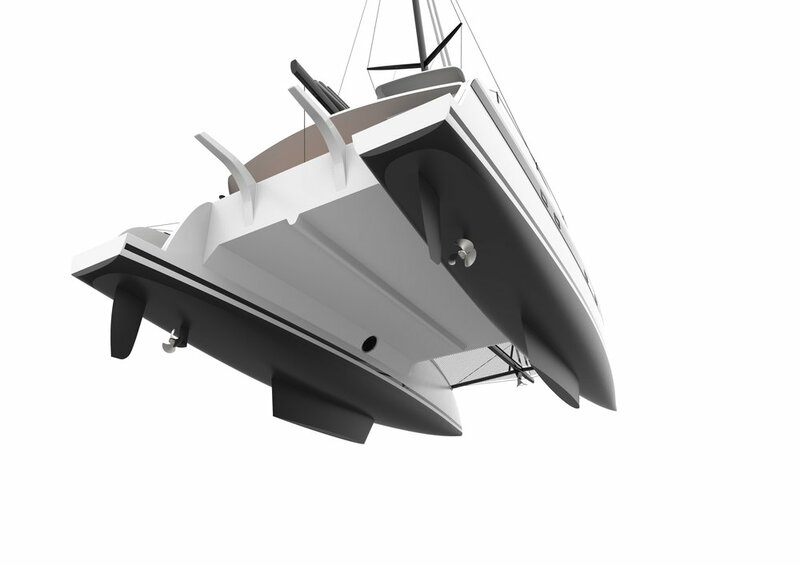 How does The Ocean Series differ from the original HH Catamarans? The biggest difference is in the construction materials. By using e-glass we have shifted the design focus towards comfortable and safe blue-water cruising and away from pure speed, and in the process, brought the cost down considerably. The daggerboards have been exchanged for winged fixed keels in the hulls and the carbon composite mast, boom and rigging has been replaced with alloy. The hull design remains the same, with generous interior spaces, ultra-durable finish, and a level of luxury found only aboard an HH Catamaran. Every line, curve and surface has been carefully considered and meticulously reworked to achieve the level of beauty and perfection that has become the hallmark of HH. The single helm station on the OC50 has been designed for easy single handed sailing. Extra durable materials are used throughout that are designed to sustain heavy use and maintain a high quality finish. Experience both excitement and comfort aboard the OC56 and the first ever HH Catamarans flybridge. The focus remains on touring in style through excellent design, intuitive systems and beautiful, spacious interiors. *HH Catamarans reserves the right to make alterations to specifications and general arrangements without notification.